The Beatles for Jazz Guitar by The Beatles. For Guitar. Guitar Solo. Softcover. Guitar tablature. 48 pages. 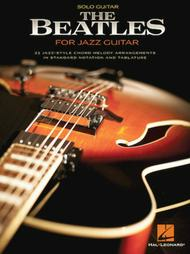 Published by Hal Leonard (HL.699051).ISBN 0711931550. With guitar tablature. 9x12 inches.This new edition features fantastic, jazz-style chord melody arrangements of 23 Beatles classics, including: All My Loving • Blackbird • Can't Buy Me Love • Eleanor Rigby • Hey Jude • In My Life • Let It Be • Michelle • Nowhere Man • Something • Strawberry Fields Forever • Ticket to Ride • Yesterday • and more!